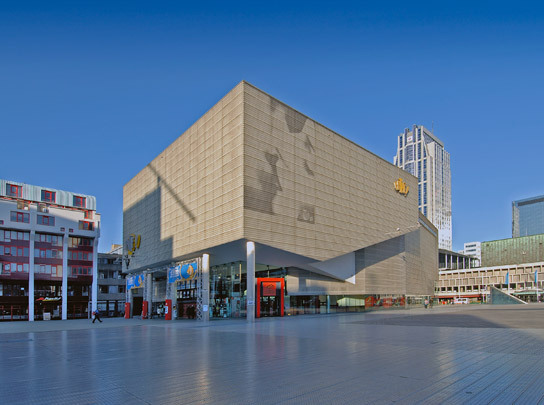 This complex of seven cinema auditoria constructed as part of the reconstruction of the Schouwburgplein sits atop the existing parking facility, necessitating a building of the lightest construction. The structure is of steel and, apart from the steel plate reinforced concrete floor slabs, carries light materials such as gypsum board and corrugated sheet. Steel columns bear aloft four big auditoria above a large foyer zone beneath which are a further three smaller auditoria. By lifting up the big auditoria, so that the 'theatre square' continues on into the foyer, and stressing the deviating lines of the auditoria, the architect seeks to reduce the impression of bulk. Much of the building is wrapped in transparent corrugated sheet.